So says Eric Jansen (www.itulip.com) in an article* which Lorimer Wilson, editor of www.munKNEE.com (Your Key to Making Money! ), has further edited ([ ]), abridged (…) and reformatted below for the sake of clarity and brevity to ensure a fast and easy read. The author’s views and conclusions are unaltered and no personal comments have been included to maintain the integrity of the original article. Please note that this paragraph must be included in any article re-posting to avoid copyright infringement. The incipient recession that the stock, bond, and gold markets smell is not a so-called “double dip” recession. It is a mid-gap recession – a recession that occurs in the midst of an output gap – and it is a far more serious economic event than a recession that produces an output gap. The U.S. has not experienced a recession inside of an output gap since 1938, except for the one produced on purpose by the Volcker Fed in 1983 [see chart below] to squeeze the last breath of life out of an inflation spiral that was showing signs of resurgence in 1982… The inflation of that period wiped out private sector debt — mortgage and credit card debt, auto and student loans, and corporate debt that had accumulated on household and business balance sheets over the previous decades. As a result, the Reagan administration started with a clean slate of low private sector debt levels, virtually no public sector debt, and a massive tail wind of falling interest rates that fueled the growth of the finance-based economy. By the end of Reagan’s first term in 1985, two years after the recession that ended in 1983, the number of unemployed had fallen from 12 million to 8 million as inflation fell from 15% to 3%. Reagan’s re-election bid was assured. Here’s is the same chart updated to August 2011. The so-called Great Recession, in contrast, was not manufactured to kill off an inflation spiral that wiped out a generation’s debts. It followed a seizure of the great credit machine that fueled the nation’s growth since the early 1980s and left it buried under a mountain of both private and public debt. The Fed cut rates to zero and via quantitative easing and other monetary tricks attempted to get the machine going again. Rather then exit the recession with private sector debt wiped out and public debt near zero as in 1983, in 2009 private debt levels were higher than ever, and deficit spending to stimulate the economy expanded public debt well beyond the already worrisome levels reached before the recession. 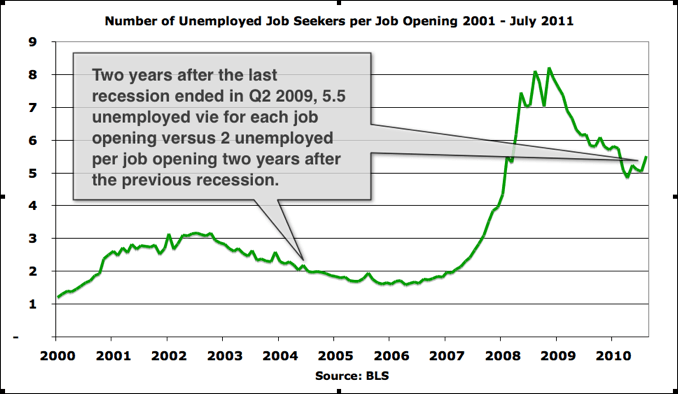 The result is the outcome I warned about in 2009: high unemployment, high inflation, and high deficits. 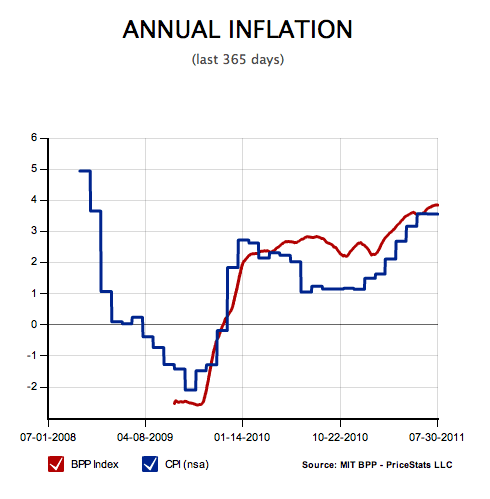 Two years later more than 14 million Americans remain unemployed and consumer price inflation [see chart below] is officially over 3%, but is closer to 4% according to the MIT Billions of Prices Project price index [see article here on this method of determining inflation]. Yet for all of the printing and spending starting in 2009, and the Fed’s success at producing inflation as Bernanke promised, all evidence points to a recession by Q4 2011. 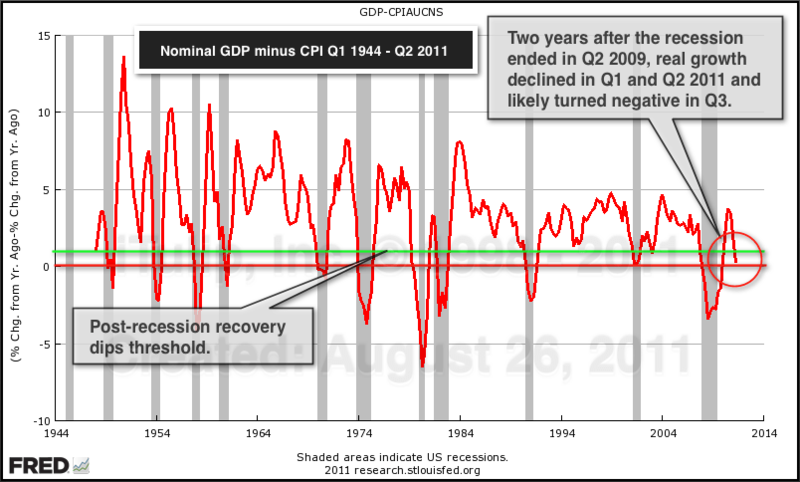 In fact, the economy may have entered a recession in Q2. The evident downward trend in economic growth two years into recovery is highly unusual from a historical perspective. Since the Fed is locked into a deflation-fighting stance, inflation will be maintained above 2% even as nominal growth declines to below zero. The result: negative 2% growth by Q4 2011. Money supply expansion via central bank operations, government spending, and direct cash injections into failing financial institutions stopped the financial crisis in its tracks. Fed chairman Ben Bernanke kept the promise that he made in his now famous 2002 speech titled Deflation: Making Sure “It” Doesn’t Happen Here to prevent a repeat of the deflation spiral and economic contraction that gripped the US economy from 1930 to 1933… In that speech [see below] he asserted that the misguided, ideological laissez-faire policy approach to the previous credit bubble crash in the 1930s would not be repeated on his watch and that, instead, an activist and radical reflation policy would be pursued. In addition, he made a reference to gold that he may regret today. “The conclusion that deflation is always reversible under a fiat money system follows from basic economic reasoning. A little parable may prove useful: Today an ounce of gold sells for $300, more or less. Now suppose that a modern alchemist solves his subject’s oldest problem by finding a way to produce unlimited amounts of new gold at essentially no cost. Moreover, his invention is widely publicized and scientifically verified, and he announces his intention to begin massive production of gold within days. What would happen to the price of gold? Presumably, the potentially unlimited supply of cheap gold would cause the market price of gold to plummet. Indeed, if the market for gold is to any degree efficient, the price of gold would collapse immediately after the announcement of the invention, before the alchemist had produced and marketed a single ounce of yellow metal. 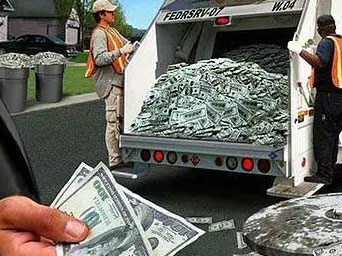 [Unfortunately,] the “production of as many U.S. dollars as it wishes” by the Fed has not come “at essentially no cost.” Trillions of dollars of credit and money expansion ran head long into a few thousand tons of gold that cannot, in fact, be expanded rapidly and at no cost. Anti-deflation policy – a pro-inflation policy by any other name – weakened the dollar and every currency on earth, as we shall see, and exploded the gold price more than five-fold from $300 at the time of his speech to over $1700 at this writing. A consequence of government spending and zero interest rates is a depreciating dollar. 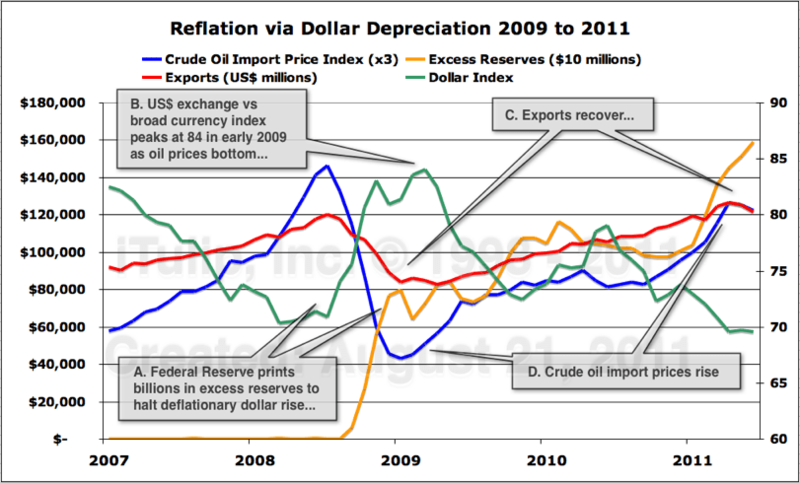 The policy succeeded at boosting exports over the following quarters and years, but the immediate aim of dollar depreciation policy was not to improve the prospects of US producers but to halt asset price deflation in the FIRE sector [finance, insurance, and real estate] with cost-push inflation from rising energy import prices. A similar strategy that was executed by FDR under similar circumstances using gold instead of oil as the price anchor. In 1933 FDR halted a runaway deflation spiral by calling in gold and devaluing the dollar against gold by 70%…Without an international gold standard the unspoken strategy this time around was to not wait three years for deflation to get out of control but to move immediately via aggressive interest rate and fiscal policy to depreciate the dollar against oil – and so it was. The immediate impact of these policies was positive. Credit contraction and deflation stopped in their tracks…No serious economic observer argues that the policies that Bernanke envisioned and later executed were not necessary to prevent the economy from collapsing once the inevitable crisis began. The pilots who flew us into this hurricane were Alan Greenspan and the Reagan, Clinton, and Bush administrations that he served under. Bernanke did not have the option of compounding the error by putting the plane on autopilot and hoping for the best. That does not mean that Bernanke will not be the scapegoat for inflationary policies in the future. The real culprits here, however, are in the White House and Congress, who failed to follow emergency reflation measures with viable long-term solutions. Two years later we have the worst of all worlds. The U.S. economy is not “catching” and growing steadily under its own power as it must in order for monetary and fiscal stimulus to be withdrawn. Yet if stimulus is continued, consumer price inflation, nacent but persistently growing, will get out of control. I said in 2010 we had until 2011 at the latest to get the economy ramped up to a sustained 4% quarterly real GDP growth rate [and] suggested a way to do this by investing public funds into energy and communications infrastructure projects to boost growth to a 4% level. Rather than adding to the nation’s debt burden [such] government outlays[would have] produced a return on investment on borrowed taxpayer money by reducing the energy intensity of the U.S. economy, the number of BTUs of energy needed to produce a dollar of GDP. Such a reduction [would have been] as stimulative as a tax cut and for the same reason: household income devoted to fuel and food [would have been] freed up for spending on other goods and services. wasted the two years and trillions of dollars, mostly borrowed, on a haphazard and misguided mix of projects, from “Cash for Clunkers” to make-work maintenance of existing transportation infrastructure. then we wasted more time arguing about whether the nation has too much public debt, when in fact public debt as a portion of total private and public debt outstanding is only 6% of total debt, down from 13% in the 1960s. Financial corporate debt, on the other hand, has over the same period grown from 2% to 37% of total debt. It is this excessive financial sector debt that is weighing down the economy and preventing the economy from recovering at a high enough rate to close the output gap. It is why this recovery is unlike any other, and why every recovery since 1980 has been weaker and weaker, generating fewer and fewer jobs, and requiring more and more new debt growth to get the economy going again. 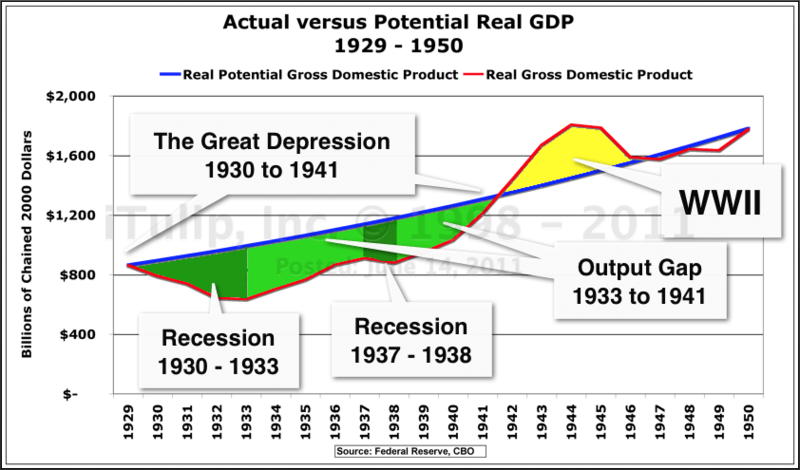 To understand the meaning of the new recession that is upon us it is important to get your head around the last mid-gap recession that happened despite muddled efforts to avert it. The Great Depression happened in two parts [as shown in the chart below]. 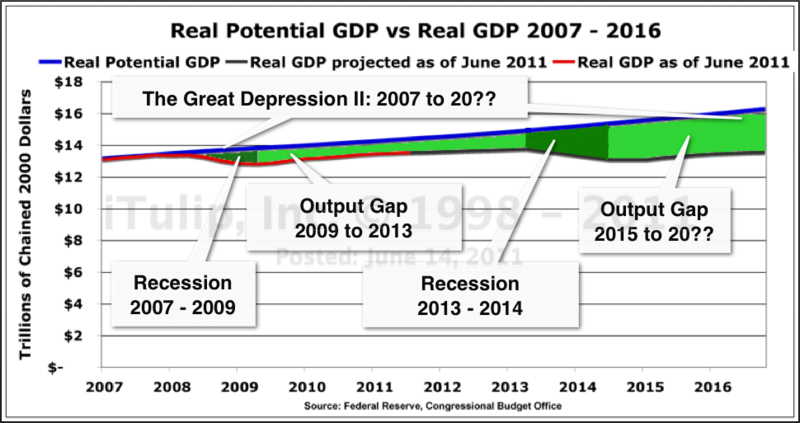 Part I was a massive recession that saw GDP decline by 25%. Part II was an output gap, the gap of between the potential output of an economy under conditions of low inflation and full employment. New Deal spending closed the gap from 24% to 14% of GDP. The New Deal stimulus spending was cut in 1937 after months of partisan bickering about the risks to the nation’s credit that deficit spending posed. Sound familiar? The spending reductions caused a new recession that widened the output gap to 17% of GDP. By the end of 1941, WWII spending, acting as gigantic public works project, closed the output gap and created a positive gap with high inflation. The current depression, like The Great Depression, is also happening in two parts. The 2008 to 2009 recession left a more modest output gap of 4% of GDP, thanks to the Bernanke Fed’s radical reflation approach. 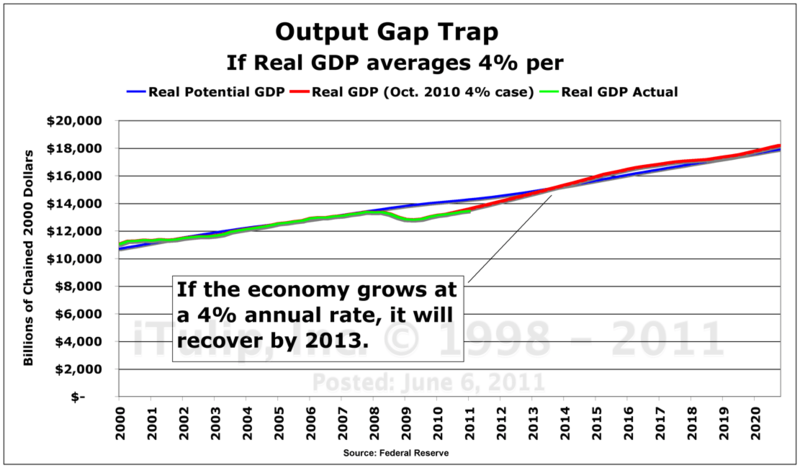 To close this gap by 2013, the economy needed to grow at an average of 4% per quarter starting in Q2 2009. A combination of monetary policy and stimulus spending helped close the output gap to 2% of GDP by the fourth quarter of 2010 but growth has averaged only 2.5% of GDP since the recovery began in the second quarter of 2009, not the 4% we need to close the gap. At that rate, the gap is never going close – ever! That, believe it or not, is the good news. Today the BLS revised Q1 GDP growth down from 1.9% to 0.4% almost no growth, and the first pass at Q2 growth is 1.4%. The past record of revisions during our feeble crawling-out-of-the-output-gap suggests another cut to near zero or negative growth is likely. This political acceleration into a mid-gap recession is occurring a full two years before my previous projection of a next recession occurring in 2013 if the U.S. fails to pursue a program of energy and communications infrastructure targeted, ROI producing stimulus programs. Once again, try as I might, just as I failed in 2001 to imagine that our leaders were crazy enough to create a housing bubble to bail the economy out of the fallout from the tech stock bubble, I was unable to think darkly enough to foresee the economic nightmare our leaders were capable of creating with alacrity. An output gap is the difference between the output of a productive economy running at full capacity and an economy running below capacity. Potential output is the old trend growth rate of the economy. It represents the good old days of 2006, with only two unemployed vying for each job opening, the prosperous economy that both producers and consumers – and investors – still hoped until July was just around the corner. Now they know it isn’t. The gap created by the global financial crisis and recession must be – must be — closed before the next recession arrives to widen the gap further… If that is not accomplished the U.S. will find itself in an economic predicament far more dire than the one posed by the fallout of the financial crisis. If we don’t make the Q2 2011 deadline to get the U.S. economy moving again at a 4% annual growth rate the U.S. will run out of foreign buyers for its government debt and sooner or later face a full-blown debt and currency crisis. As the U.S. is at the center of the global monetary system, and over 80% of the world’s international transactions are dollar-based, a dollar crisis is a global economic calamity without precedent that will drag all other currencies down with it, with no quick-fix solution like the multi-trillion dollar global fiscal stimulus and bailouts that pulled the world economy back from the brink in late 2008 and early 2009. This second recession will put US finances on an even more precarious footing. Today, the opposite is the case. Gold is starting to look like a can’t lose bet to more and more market participants, including governments that are US political allies. Previous Ron Paul: Love Him or Hate Him, His Investment Approach is a Big-time Winner!